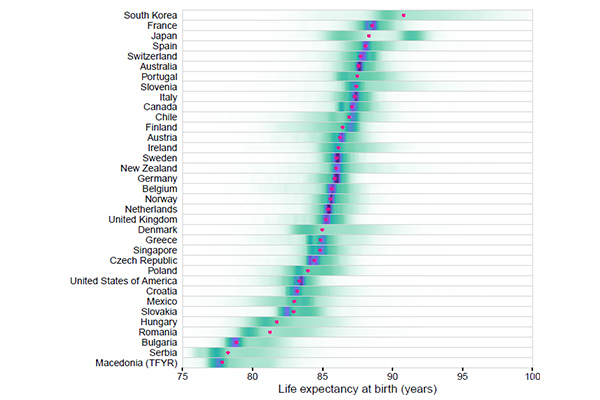 Forecasts mortality and life expectancy are needed to plan for health and social services and pensions. We develop novel sophisticated methods for mortality forecasting, and for analysing how policy scenarios, for example those related to disease prevention, may modify the forecasted trends, at scales from subnational to global. Recent work has expanded to forecasting using Bayesian model ensembles, which have been rarely used in population health and incorporate uncertainty about the choice of models themselves. Lancet, 389 (10076), pp. 1323-1335, 2017. Journal of the Royal Statistical Society: Series C (Applied Statistics), 66 (1), pp. 121-139, 2017. Lancet, 386 (10011), pp. 2391-2392, 2015. Lancet Global Health, 3 (12), pp. e746–e757, 2015.